Sheds, Sheds, Glorious Garden Sheds! I don’t want to sexist but there seems to be something peculiarly English about the Garden Shed and the way it is held in high regard by men. Or is it a universal pre-occupation with the male species? 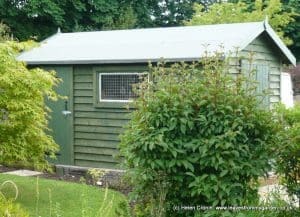 In the UK, Garden Sheds are usually the prerogative of the man of the House, it’s his space and his dominion. 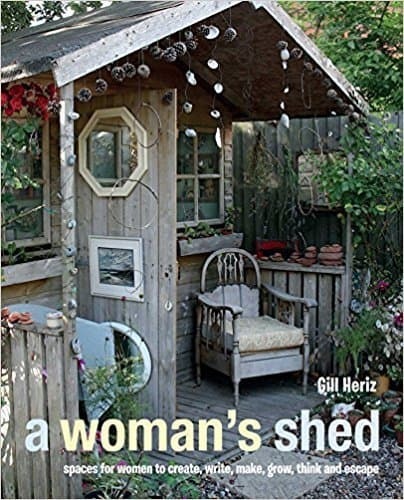 However, there is a growing trend for She-Sheds, there are even books published about them. Here at Dovewood the balance has been re-dressed, we have ‘his’ and ‘hers’ ! When Old Tim and I got married we agreed that our garage could be divided 60/40 as he needed space for woodworking, and I needed space for the mower and gardening tools. The ratio soon changed to 90/10 and a solution was required. 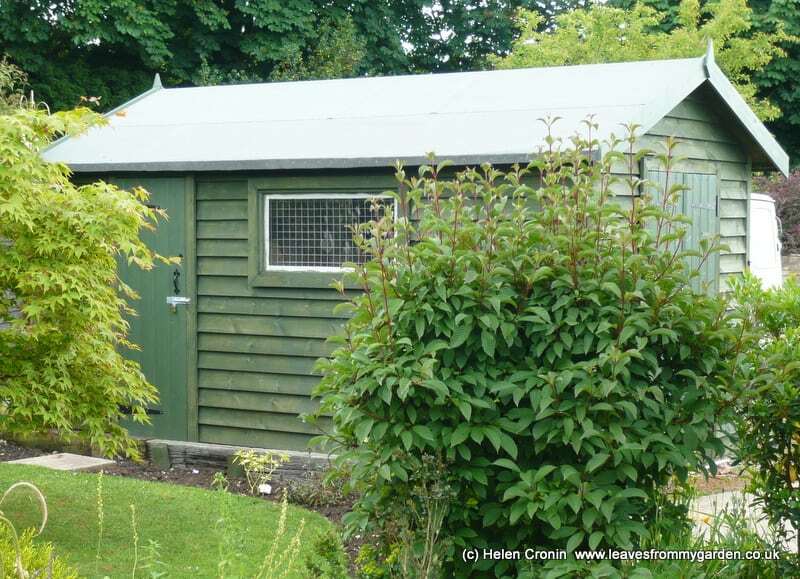 Dear hubby said he would build a new shed which could be storage for him, and a dedicated Garden store for me. I was a bit miffed when the site he chose for the new Shed was on what I considered the best bit of soil in the garden. But it made sense to position it there. I moved the plants and cleared the ground. As he always (and quite rightly) likes to do things properly, we had to dig out the ground and create a concrete footing. He then constructed a timber framework, boarded the outside with feather-edge, and panelled the interior. The storage was split 70/30. The Building was and is lovely, well-built, and perfect in every way except for the fact that Old Tim outgrew his space quite quickly. A new solution had to be found. But all was not lost! I had a brain-wave….the log store down the side of the garage was long and thin, and the logs only needed the end bit. I could have two thirds of the Store for my gardening equipment. Which meant Tim could have the whole of what we call the Green Shed. So sleeves were rolled up, the Log Store was made good, and a rustic door fitted. At last! I had my own space, complete with potting bench. 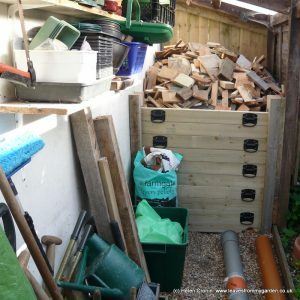 I had my own Garden Shed even though I had to share it with the logs! A rather untidy Log Store which eventually became ‘my’ Shed! Move forward a few years to 2013 and the re-build of the Garage. Sigh. We decided that if we were to rebuild the Garage it would be sensible to make it a decent size, and give Tim a bit more elbow room for woodwork. We could extend the footprint to include the Log Store. Our lovely neighbours agreed the back wall could be the boundary wall between our properties. As recompense for the inconvenience of the build, Tim offered to re-build their storehouse between the boundary and their Garage. At last! My very own Garden Shed. Oh! My joy knew no bounds. I love my shed. I have complete control over what can, and can’t live in there. If there is ever any suggestion that something might find a home in it, it has to pass my scrutiny first. As to which tools I actually own and use, well that will have to wait for another day. As will the organization tips I have for you. 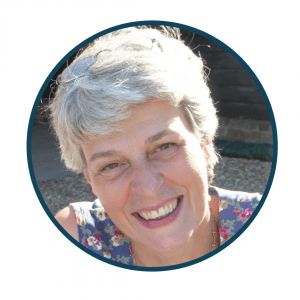 In the meantime if you would like to read more about the Sheds other women own, you can read more by clicking on the image below (This is an Amazon affiliate Link – which means if you purchase I will receive a small commission). 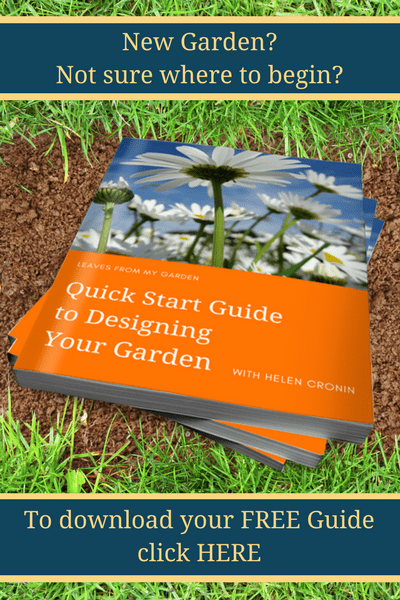 Whilst something of a Coffee Table book there is plenty to inspire. Enjoy!